International Journal of Research in Health Sciences,2017,5,4,13-20. Assistant Professor, Department of Community Medicine, Dr RPGMC, Kangra (Tanda), Himachal Pradesh- 176001, INDIA. Introduction: An effective combination of different teaching methods is required for producing competent medical graduates who are knowledgeable and skilled. Objectives: To assess the effectiveness of different T-L methods in improving the knowledge and communication skills of medical students. Methodology: This study was an interventional, analytical study in which 100 MBBS students were divided into four equal batches A, B, C, D, after taking informed consent. Different teaching learning methods were employed for different groups including didactic lectures, interactive and integrated lectures. Additionally for teaching communication skills, videos and role plays, were employed. 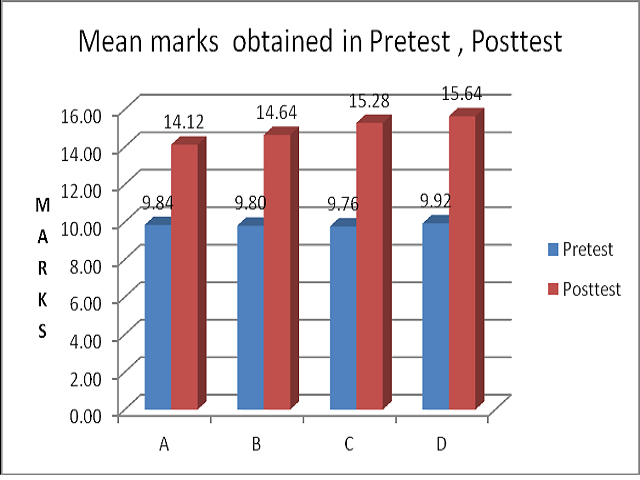 Results: The mean marks obtained in Pre-test, Post – test, were analysed using a paired T-test. A statistically significant improvement in the knowledge scores was observed for all the four groups (p<0.0001). The percentage gain in knowledge scores for groups A, B, C, D, was 21.4%, 24.4%, 27.6%, 28.6%. The percentage gain in communication skills assessment for groups A, B, C, D, was 22.8%, 28.5%, 40.0%, and 45.7%, respectively. Conclusion: Integrated and interactive teaching improves the learning outcome among the students compared to traditional didactic lectures. Similarly, role plays and video demonstrations are more effective in improving the communication skills of students.